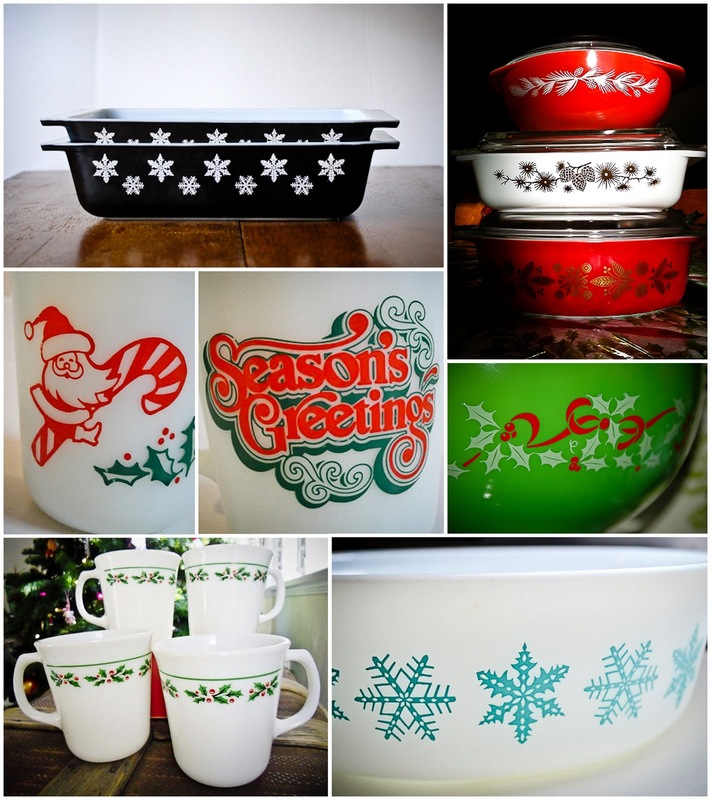 Well, folks, my 12 Days of Christmas series of posts is complete for another year! Again, I had a blast writing them and I'm shocked I made it through in time. Another big thank you to all of my guest posters — I couldn't have done it without you. In case you missed any along the way, here they all are in one convenient list. I hope everyone has a very merry holiday with their families and loved ones, full of relaxation, laughter, full bellies and fuzzy heads. Thank you for another fantastic year. I'll meet you back here in 2012. I know gift certificates can be impersonal gifts, but I can't exactly send you all an apron — I'd be sewing until next Christmas! 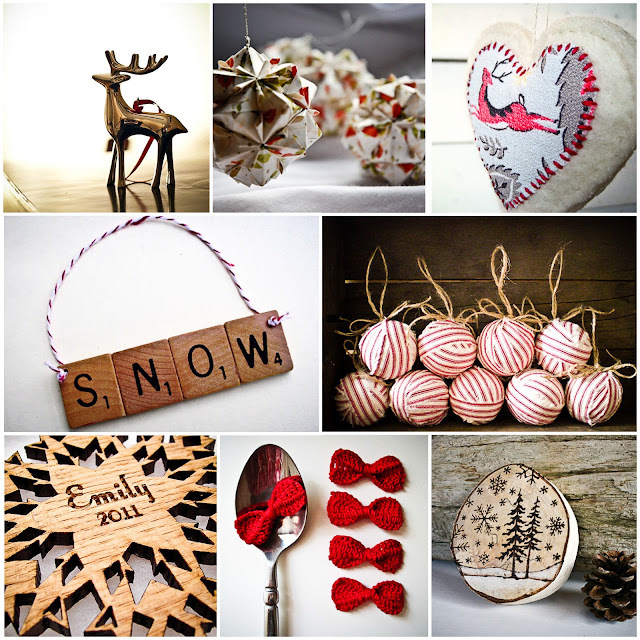 So, as a thank you to all the lovely customers who bought handmade Dear Edna items this holiday, to all the readers who stuck it through all 12 of my 12 Days of Christmas posts, and to everyone who supported me and my business, morally or otherwsie, over the last year.... I'm giving each of you a chance to win a $50 gift certificate! That's one reversible apron, one men's apron + shipping, two personalized totes, one tote and one cosie... the list goes on. Haha! To enter the contest, simply leave a comment below. Plus, if you mention Dear Edna and this giveaway on twitter or facebook, you will get another entry for each. The contest is open to everyone, in all locations; family and friends, don't be shy, this contest is a thank you for your love and encouragement too! The contest ends on December 31st at midnight and the winner will be announced here. If I do not hear back from the winner within 48 hours of the announcement, I will redraw. I followed the recipe in the Feb/March issue of Readymade Magazine, but boy do I wish I had looked online first, as there are some major problems with the recipe. 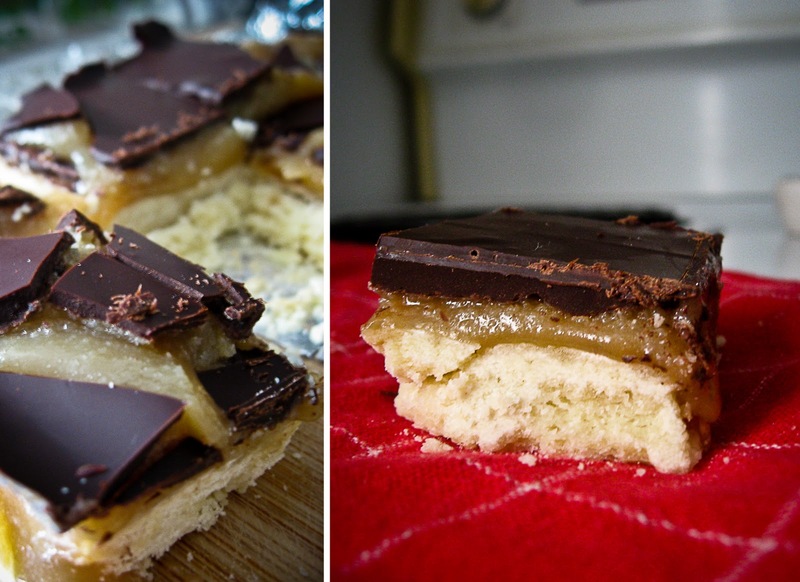 First of all, the shortbread dough would not hold together. I added butter to remedy the situation on the fly, but the end result was still pretty crumbly. Another problem, the caramel turned out much too runny. I boiled it a little longer than the 5 minutes recommended and hoped it would thicken when chilled, but it didn't. Caramel ooze everywhere! They were pretty difficult to cut into bars, for this reason. I only got one or two nice squares out of it. The rest looked like a natural disaster hit my pan. Finally, this recipe is super time-consuming: I baked at least 4 dozen other cookies in the time that I was making these 12 bars! All that being said, I agree with the many comments on the site that these are really "tasty little messes," so I think I'll give them another chance, with adjustments (included below). Either mix the shortbread ingredients together in a food processor or do it the traditional way by sifting the flour, cornstarch, and icing sugar into a large bowl, adding the cubed butter, and using clean fingertips to rub together until a dough forms. Form dough into a ball and wrap in plastic wrap; put dough in the fridge to rest for 1 hour. Meanwhile, prepare a 9-inch-square pan, lining the base and sides with a single piece of foil or parchment paper. Use the back of a spoon to flatten rested dough into pan. Preheat oven to 325°F. Prick the top of the dough all over with a fork and bake for about 40–45 minutes, until light brown and starting to come away from the edges of the pan. Allow to cool in the pan for at least 1 hour before you make the caramel. To make the caramel, put the sugar and cream in a heavy-bottom saucepan set over low heat. Heat gently, stirring with a wooden spoon as it comes to a boil. Once it is boiling, add the butter and stir. Bring the caramel back to a boil and let it bubble gently for 10 minutes or until it thickens, stirring occasionally. Take the caramel off the heat, add the salt, and stir vigorously to ensure that it is thoroughly mixed in. Then, working quickly, pour the caramel on top of the cooled shortbread. Put the pan in the fridge for at least 1 hour to cool and set. Once the caramel has set, melt the chocolate following the instructions for tempering. Pour the melted chocolate on top of the caramel and spread it evenly with a rubber spatula. Allow the chocolate to set before lifting the shortbread out of the pan (using the foil or baking parchment) and cutting into squares with a hot knife. The squares will keep stored in an airtight container in the fridge for up to 3 days. My second new recipe came from the book Marie Claire: Zesty and was much more forgiving than the above, thank goodness. Be forewarned, however, hey are very very rich, so you may want to dust them with icing sugar rather than the cocoa powder, as the recipe suggests, and I don't think they really need to be sandwiched. But what's done is done and they look cute. So grab a glass of milk and choke those suckers down, ok? Sift together the flour, cocoa, baking powder and salt into a bowl. Melt the butter and chocolate in a bowl over a saucepan of simmering water, stirring until smooth. Remove from the heat. Add the sugar, stirring until dissolved. Stir in the eggs, one at a time, until well combined, then fold through the dry ingredients. Refrigerate the mixture for 20 minutes or until just firm. Preheat the oven to 350°F. Roll into one-inch balls and place onto cookies sheets. Bake for 5-7 minutes or until firm. Cool slightly on the sheet before transferring to a wire rack. To make the chocolate cream, heat the chocolate and cream in a bowl over a saucepan of simmering water, stirring until smooth. Remove from heat and allow to cool. 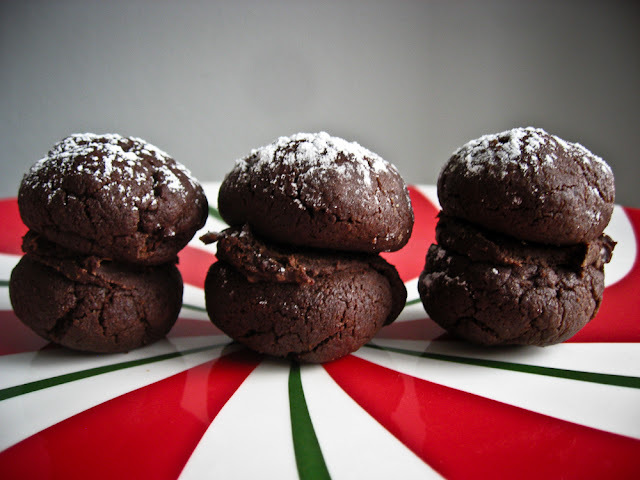 Stick the bases of the cookies together with the chocolate cream and lightly dust with cocoa or icing sugar. Store in an airtight container. Makes 40 cookies (20 sandwiches). 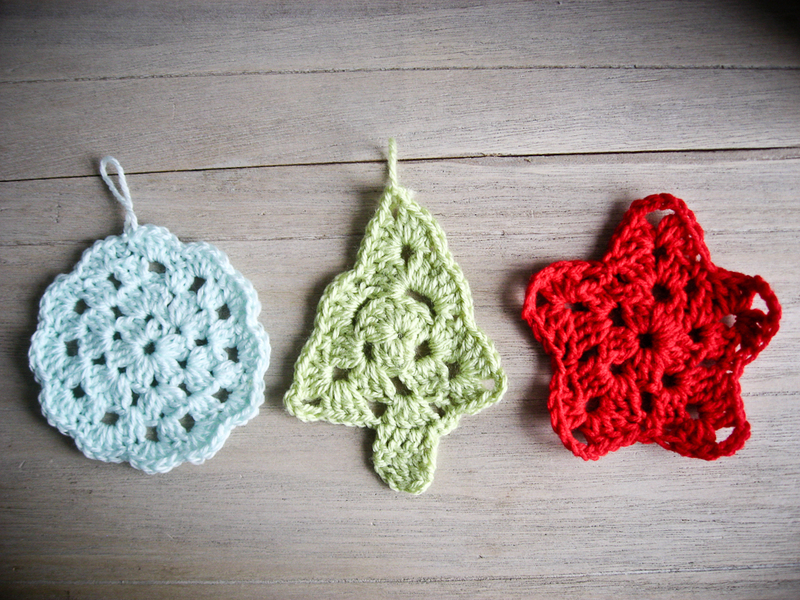 All three of these adorable crochet ornaments/gift toppers can be found on The Royal Sisters blog with really easy-to-follow instructions that this beginner certainly appreciated after stumbling through this not-so-easy pattern. Each one starts the same way and uses the same basic stitches to get the various shapes, so you catch on pretty quick. I got these down to 15 minutes a piece. Let's race! 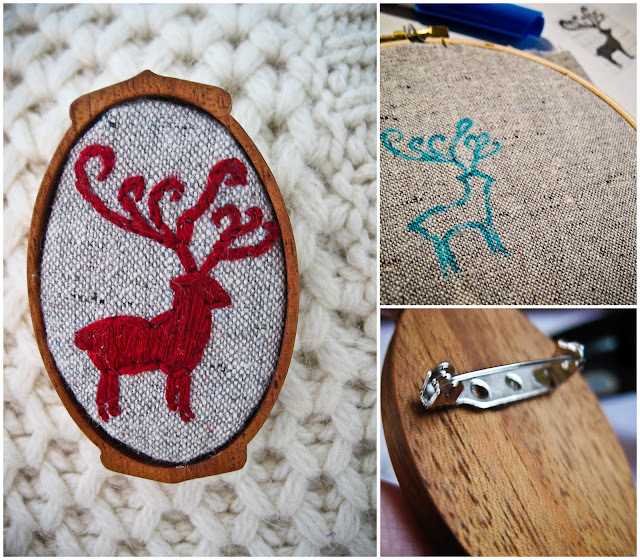 The inspiration for this little fella came from this cross-stitch pattern by andwabisabi . I purchased the pattern, and fully intend on cross-stitching it, but I wanted something smaller and quicker and have been thinking about making stitched brooches for quite awhile. Plus, I don't have a Christmasy brooch - crazy, I know! After I shrunk down the pattern and transferred it to fabric, I quickly realized it was much too tiny to cross-stitch, so I tried simply embroidering it with little satin stitches. This was my first time embroidering without cross-stitch, and I think he looks pretty good. To finish it, I traced the brooch shape onto cardboard, trimmed the fabric so it was about a quarter-inch longer than the cardboard and cut out an oval piece of quilt batting to place in between the fabric and cardboard. On the back, hand-stitch along the edges of the fabric, pull tight and tie off. Then secure both the fabric and pinback to the frame with hot glue. I bought this gorgeous wooden frame from artbase in the Fall, but I'm sure it would be lovely without the frame too. 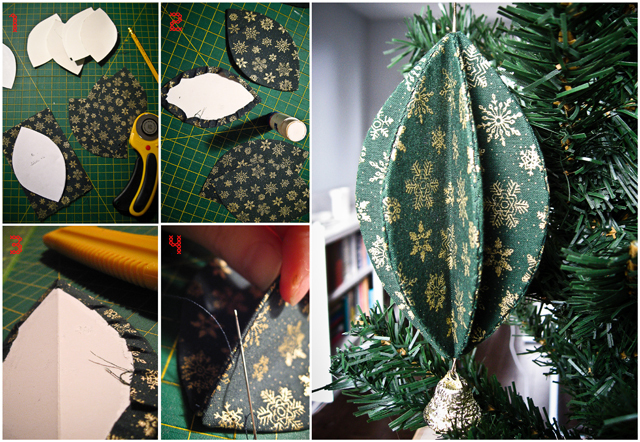 To make, cut out two leaf-shape patterns (8cm x 14cm and 6cm x 12cm) and proceed to cut 6 pieces of the larger shape out of fabric and 6 pieces of the smaller shape out of cardboard. Glue the fabric to the cardboard — when you get to the tips, fold down the fabric over the point first and then the sides. Using an exacto knife and ruler, slice along the center of each piece, being careful not to cut all the way through, and fold. With wrong sides facing, hand-stitch along the edges. Keep doing this for all the pieces. Attach a loop to the top and any fancy adornments you'd like to the bottom before sealing it up. Don't worry if the ends seem kind of open, just keep stitching and pulling tight and they'll close up. When you wear something shiny in December, people call you "festive"; when you wear something shiny the other 11 months, people call you "tacky". Mostly I'm tacky, I guess, but in December I just fit in. Here's a guide of how to add some shine to your holiday from a little touch of sparkle to over-the-top. I recommend over-the-top shine. 1. If you want to take it easy in the shine department, stick to a eye-catching necklace. This allows you to share the spotlight with the mini quiche that you handcrafted. Is handcrafted a word you use when describing mini quiche? I've never made them. 2. 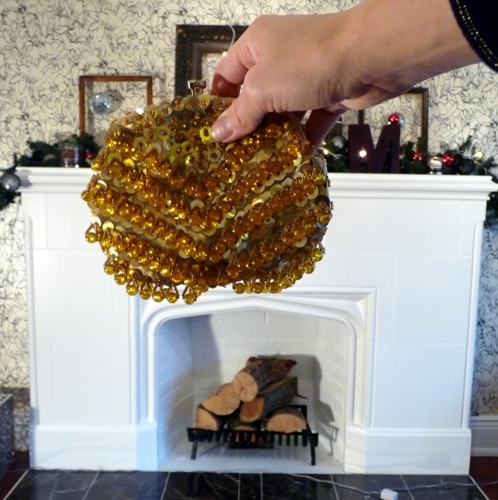 A vintage sequin clutch is a good way to convey some holiday shine. The key is to find one that is just big enough for a little flask. I love my family very much but for some reason they think that one bottle of wine is enough for a whole evening. Someone tell my mom... it's not enough. 4. 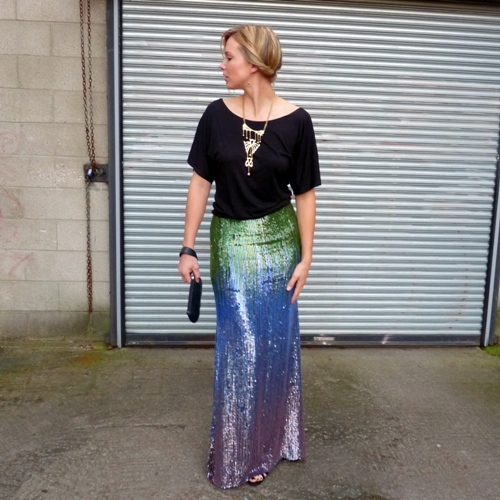 When you wear sequins from navel to toe, you've probably crossed past dressing "festively". I wore this to Matt's company party this year. It was a little crazy but a lot of fun to wear; though it hardly left room for any mini quiche... handcrafted or otherwise. What's a holiday without a festive adult beverage... or five? Last year I wrote about three of my favourite wines, but this year I thought I'd venture into the world of beer, a drink I enjoy quite often, yet rarely talk about for some reason. Some breweries release special edition holiday/winter brews this time of year, which makes it a perfect topic for the 12 Days of Christmas and an even better excuse to indulge in a taste test with my favourite beer-drinking companion. It was an unfortunate decision on our part to drink many of these (plus a few that didn't make the cut) in a single evening, as holiday brews tend to be extremely rich stouts and porters, and thus had us feeling pretty sick to our stomachs by the fourth pint. This no doubt affected our ratings, so I've listed them in the order they were drank. Also, keep in mind that I am much more of a summertime blonde and blanche type of girl, so you will notice this reflected in my ratings as well. If you've had a chance to taste any of these beers or have another holiday favourite, I'd love to hear your opinions in the comment below. A slightly hoppy, dark copper ale with a spiced tongue and malty finish. We felt it went especially well, if not better, with food. A nice, rich berry front with a very dry, dark chocolate finish. One bottle is plenty for two and it goes down even smoother with a delicious cheese platter from The Brain. Bonus points for the awesome bearded label! This copper-coloured lager is the clear winner, with a nicely balanced malty front, light hops, and distinct flavours of cloves and oranges. Between the two of us and the sweet bartender, it was agreed, "It just tastes like Christmas!" We had high hopes for this one, after falling in love with it a few Christmases ago, but we were disappointed to find it had lost the strong cinnamon and spice notes we had remembered. It is an amber ale with a slightly caramelly malt front, lightly spiced, very mildly hopped, and smooth, but a little bland for a holiday brew. Hello again — it’s your friendly neighbourhood redhead back on the Dear Edna beat for another round of her annual 12 Days of Christmas countdown. 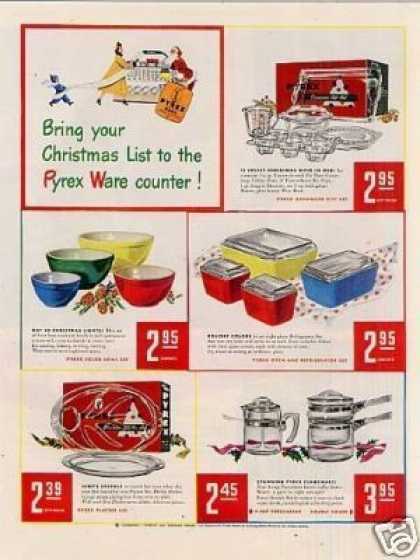 This year, however, I’m leaving you to your own devices to figure what to wear to your Christmas parties, and instead I’m telling you about holiday Pyrex! This post was written by Carla of the De Facto Redhead blog, where she writes about fashion, books, baking, thrifting, and "any other fun, girly things that women out there like reading about." She is a regular contributor here and you can follow her on facebook and twitter. One of my favourite holiday traditions is the one I share with my "Toronto girls". For the seven years we've been friends, we've gathered together for a gift exchange. It started out as small gifts, and we tried a cookie swap once or twice, but for the most part we've given each other Christmas ornaments, and there couldn't be a better gift for this group of Christmas-loving girls. I love shopping for them each year even more than receiving them, and I have to say it feels pretty warm and fuzzy knowing I have a special place on all their Christmas trees! I always seem to buy my ornament last-minute, but if I were on the ball (har har! ), I would have ordered one of these unique beauties from Etsy. Perhaps I should pre-order for next year, ladies? I sent off the last of the Dear Edna Christmas orders to be shipped today! Woo! And now I can breathe. It's been an incredibly busy holiday season this year and I just wanted to take a moment to thank everyone for shopping handmade this Christmas and for supporting my little business. I couldn't have asked (or sewed) much more. In the middle of the craziness, Mike reminded me of how special it is that I get to be a part of so many people's Christmases all around the world. It's so true and it's what kept me sewing night after night. I felt like Santa as I trotted to the mailbox everyday with my bag full of prezzies. From the bottom of my heart, thank you, thank you, thank you! 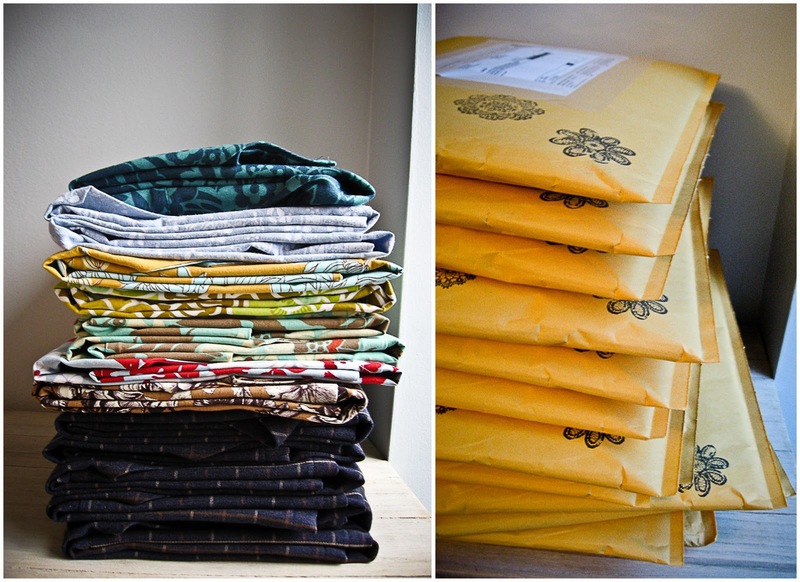 Now it's time to sew all my local friends' orders and to enjoying all the things I love so much about the holidays! Speaking of which, let's get back on track with the 12 Days of Christmas programming, shall we? 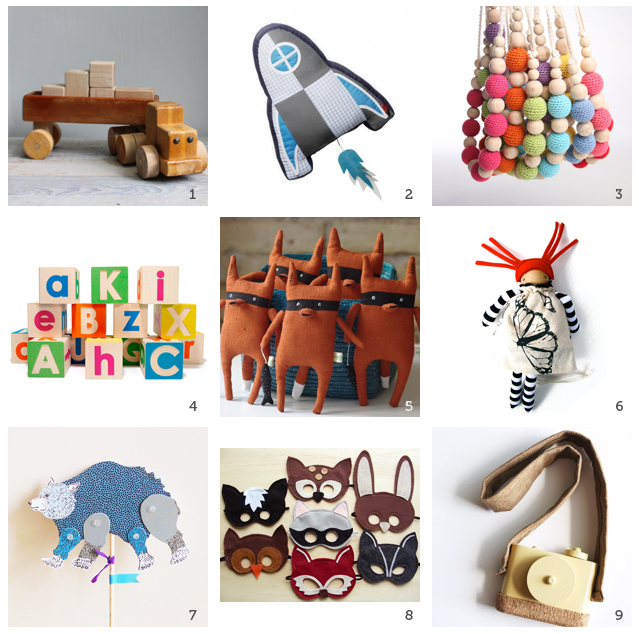 Surrounded by friends and family who are expecting or already have a little one (or two) in tow, I knew I needed to add a gift guide for kids this year, but nowhere near the baby game myself, I had the sense to ask for some help in curating it. I immediately thought of Bess, from the English Muffin Blog, and I'm so glad she agreed, because she found some of the most adorable handmade goodies, perfect for kids of all ages! Thanks, Bess! 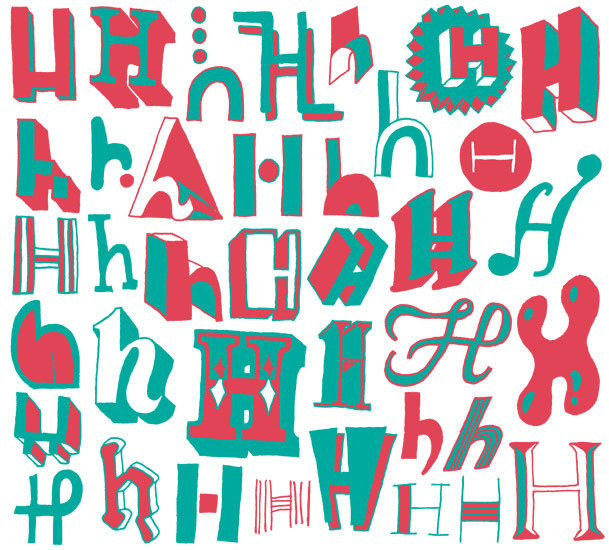 What a fun little blog assignment this was! 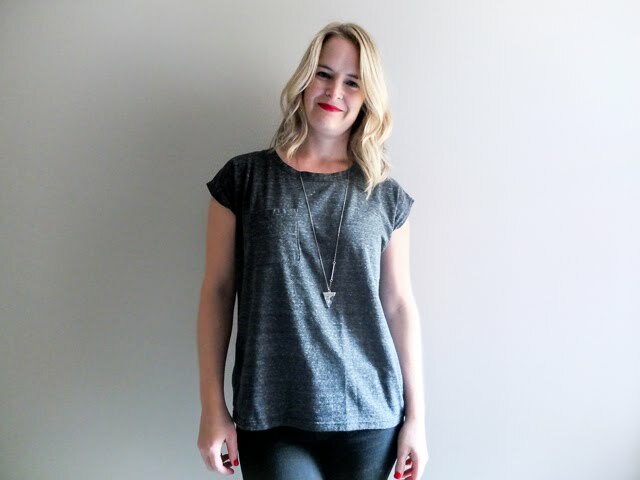 Erin approached me about curating a children's gift guide a little while ago, and I jumped at the chance to share my holiday gift picks with all of you. I have to admit that I'm a little new to the world of buying gifts for kids, mostly I work on the other side of things, creating artwork with little ones in mind. However, over this past year we've had some new additions in our extended family, and my husband and I will be welcoming our own little baby early next year. 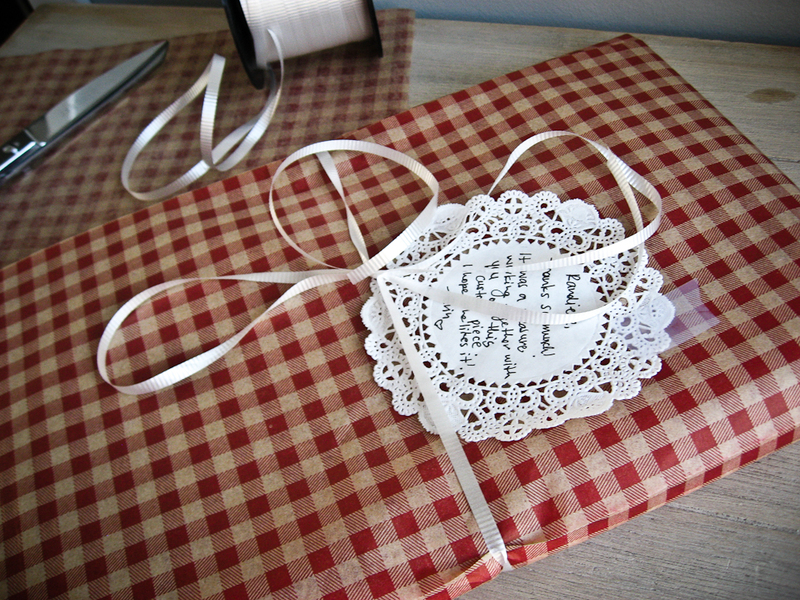 So, needless to say, my Etsy favourites and Pinterest folders have been filling up with gifts for kids that I love. Maybe I've always been too busy at this time of year to notice (shame on me), but I was shocked at how many festive events are going on in Hamilton this month! I just may allow myself to be lured away from my sewing machine for some of these. Have fun, stay warm, and shop local! Santa Shuffle Fun Run and Elf Walk / Dec. 3 / 10am / St. Mary's H.S. / This 5k run has become a tradition with me and my friend Carla ever since we lived in Toronto together. It was the first race I ever ran and it ignited a love of running that took me through several marathons. But this is the first year I've run it so completely unprepared. I haven't had my runners on since September! But, isn't tradition what the holidays are all about? Maker's Market Holiday Edition / Dec. 3 / 10-4 / Christ's Church Cathedral / Skip the mall and come out to support our vibrant local art community. From handmade jewelry and art, to delicious baked goods, you are sure to find some unique one-of-a-kind gifts here. A Kenny & Dolly Christmas / Dec. 8 / Carmens Banquet Centre / Anyone that saw me carrying around my newly purchased Kenny Rogers Christmas album at last month's art crawl can attest, I love me some Kenny. I also love me some Dolly. Unfortunately, that's a lonely island of love, so I doubt I can convince anyone to join me for this tribute so I'll throw on my record instead. Art Crawl / Dec. 9 / James St. North / A great opportunity to pick up some unique gifts and support some amazing small businesses. I imagine the evening will be full of holiday treats and surprises. Dundurn Castle / Dec. 9-29 / There are some wonderful events planned for Dundurn Castle this entire holiday season, from baking and craft workshops, to caroling and, of course, seeing the castle all decked out for Christmas. I've been meaning to revisit for awhile now and this unique opportunity just might get me there. Kitestring Christmas Spectacular / Dec. 16 / Hamilton Conservatory for the Arts / This third annual bash features a holiday pageant accompanied by a candy buffet, a Cake & Loaf cookie and milk bar, a Red Hill Coffee bar, and food from Gorilla Cheese. There's also an after party complete with live music, spiked snow cones, and cupcakes. It sounds like the party of the year and all profits benefit Culture for Kids in the Arts! Toronto All-Star Big Band / Dec. 17 / 2 pm / Hamilton Place / I had the opportunity to see this big band play a few months ago and was blown away. These kids can really belt out the oldies. When I heard they were playing a holiday show in Hamilton, this carol lover couldn't resist! Gingerbread Holiday at the Market / Dec. 17 / 10-2 / Hamilton Farmer's Market / Perfect for the kiddies, make traditional gingerbread cookies and a unique holiday ornament with guest cooks Jennifer Haartman and Kelly McKinney. Santa just might drop by for a cookie. The McQuesten's Childhood Christmas / until Dec. 31 / Whitehern / I have a strange fascination with Whitehern and the family that lived there, so I'm pretty excited to see this historic home decorated as it would have been for Christmas in the 1880s, complete with a whimsical Christmas tree, original toys, and a table set with special-occasion china. Outdoor Skating Rink Pier 8 / Discovery Drive / weather permitting / Ice skating is one of my absolute favourite winter sports, but for some reason I haven't laced up my skates in years. This is such a perfect spot to do it, with a view of the bay and Williams hot chocolate only a few strides away. Hey, I'm Mikey J... you may recognize me from being mentioned in such blogs as this one, and my part time stint as an Etsy apron model. Below is my official list of must haves for himself - the modern gentleman - in this year of 2011. If this list, made for purely selfish reasons, helps any of you clueless shoppers out there, you're welcome. I apologize in advance for any lack of the exclaimation (!) you may be accustomed to in a Dear Enda blog post. 1. Paradise by Slow Club: I'm hooked on the song "Two Cousins" (a high pitched number I've been attempting to sing around the house, much to Erin's chagrin), among other tracks from this solid second album. Really, this could just be a list of albums (Wilco, Bon Iver, Cults, etc. ), but that's probably not good blogging. 2. Windowfarms: The future is here and it's me growing greens and herbs indoors all winter, while remaining the worst at watering. 3. Leather Belt by robynchristopher: I need a belt - mine is an embarrassment. Also, this buffalo one is a good choice from Amy Kenny, whom Erin got my badass bike grips from for my bday. 4. Canadian Wool Blanket by Old Faithful Shop: Sold out but also available from the source, Macausland's Woollen Mills - I dream of a day when I can lie on the couch and have both my feet and my upper torso covered by woolen warmth at the same time. A thousand curses on you short throw makers. 5. Felted Moose Slippers by FeltingbyEglut: Erin's been singing the praises of slippers for years and I think I'm ready to join the slippered masses with these moosed-up fellas. 6. Demetri Martin live: last minute entry: I've watched all of the episodes from his show, his special, his Daily Show correspondences and I own his book (albeit unread). My brother and I even did a homage to his sketch pad routine at my mom's wedding 4 years back. I need this. 7. Soft Core Wool Vest by Outlier: I know, I'm hooked on their gear... it's crack for the bike commuter. It's too pretty to be technical. 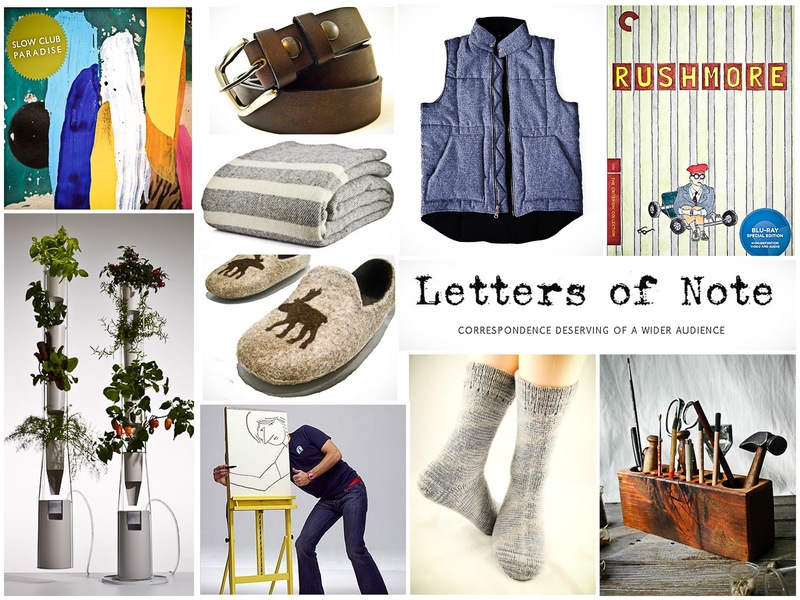 8. Letters of Note by Shaun Usher: I've been a regular on this site the last year - perfect material for a book. 9. Merino Socks by pawfelts: Warm feet are always a theme this time of year and merino has to be near the top of my all time favourite wools list. 10. Rushmore / Criterion Collection: Probably Wes Anderson's best just got the Criterion Blu-ray treatment. All that quirky better pop. Also accepting The Darjeeling Limited. 11. Desk Caddy by PegandAwl: I think this may be the difference between an organized painting nook and my painting nook. Next step: painting something again.